Manager Williams was unable to attend after a back injury, so Jack Dalgarno and Ross Blease took the reins until Coach Hancox arrived from work duties. Johnner had their chances, a Dalgarno shot was save by the diving Glendale keeper, and then a R. Blease shot went over the bar from a Forbes corner, but found themselves 1-0 down at half time and truth be told could have been a lot worse were it not for some missed chances by the away team. 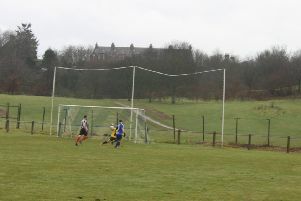 Glendale went 2-0 up as the second half kicked off after a lapse of concentration from the Wairds park outfit. Five minutes later they brushed themselves down though and went into action as Ross Blease slotted home a penalty, awarded for a hand ball in the box, to bring the score to 1-2. A minute later a shot from Smith was parried away to just outside the 6yd box which allowed Jordan Harrison to score his first goal for Johnshaven. Another minute on and a R. Blease shot was saved but Liam Bailey was on hand for the follow shot scoring from close range his first goal for Johnner to make the score 3-2. On the hour mark Johnshaven made their first substitution when Leven replace Keogh. Glendale scored a free kick to tie the scores again but Scott Beedie soon put Johnshaven back in the lead after a good cut back from Bailey. Score 4-3. Steven Smith collected the ball on the half way line from R. Blease before going on a fine solo run then slipped the ball past the advancing Glendale keeper goal to give Johnner a two goal lead. In the 75th minute a Johnshaven free kick by Forbes found Scott Beedie who controlled the ball on his chest before half volleying it home to make the score 6-3. Johnshaven made their second substitution when Sword replaced Forbes. Jordan Harrison wrapped things up with the goal of the game as he skinned three players and blasted past the keeper. This was a much needed victory that will do wonders to lift morale in the club.